Manzano High School is a vibrant community with plenty of activities for its 1,750 students spread across a sprawling campus in Albuquerque, New Mexico. It, like other high schools, faces a challenge in communicating with students to make them aware of events and to encourage their participation. Assistant Principal, Ken Tuley has been wrestling with this issue for some time and finally turned to StrandVision Digital Signage to open a new communications channel to students. 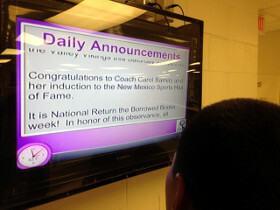 Like many older schools, Manzano High School has a cable television network that has been neglected and has fallen into disrepair. Yet, Assistant Principal Ken Tuley recognized its potential to reach students with timely information in classrooms and public areas where they gather. Ken had been experimenting using an old MacBook and Keynote slide shows sent to a few screens. During the summer of 2012 he decided to get serious about searching for a viable digital signage solution. He found StrandVision along with two or three other digital signage providers on the Web and used their trial packages to test drive the services. After testing the systems he found that StrandVision was the easiest to use. Talking with Mike Strand convinced him that support would be good and that StrandVision was the way to go. The administrative staffers who were working over the summer also thought that StrandVision looked the best on the mix of old CRT and newer LCD displays. Now Ken uses the same MacBook to host the signage system and connect to StrandVision's cloud-based digital signage servers. The cable head end accepts a video feed from the MacBook so he is able to distribute the signage over a coax system channel to all of the active cable ports in public areas, as well as classrooms where teachers are encouraged to turn on the TVs during break times. The system complements traditional student communication, such as announcements and posters, but adds another dimension. "If kids don't have a class at the time of the daily announcements or they're not paying attention, they could miss the audio announcements," said Ken. "With StrandVision Digital Signage the news is on the screens throughout the day, including lunchtime, so they have the opportunity to see them several times throughout the day." Daily announcements are posted by a secretary directly to the StrandVision Digital Signage cloud server from a Google spreadsheet. The built-in StrandVision scheduler assigns the correct block schedule for each day with the option to insert special assembly schedules. In addition, being a visual medium, the digital signage enables the Activities Director to highlight events with photos of sporting events and social and club activities. The Student Senate is also encouraged to use the digital signage system and students can post notices and pictures through the Activities Director. The StrandVision Digital Signage system is also immediate. Ken tells of the recent senior class photo. While the photographer was setting up the photo, Ken took a quick shot with his phone and had it uploaded on the digital sign by the time the photo shoot was over. The kids loved that. Another excellent use of the signage is to promote electives. Teachers are submitting "ads" for Advanced Placement and elective courses, such as Anthropology, Photography, DECA and Art History, complete with contact information and sign-up deadlines. Ken is happy with the StrandVision Digital Signage system. He said, "Things need to work for me and they need to work now. That's what really sold me on StrandVision. I really do appreciate their level of support and attention to the product. The response has been tremendous."